Reading the full text of Pope Francis' Amoris Laetitia, I experienced the odd sensation that the Pope and I must have been poring over the same exact Church documents for the past two years. The themes of faithfulness, personal freedom, fruitfulness, and total gift of self are woven throughout the Pope's exhortation, and of course they're the central points of our recently released book The Four Keys to Everlasting Love. This article looks at what Pope Francis says about the first key, faithful and forgiving love. 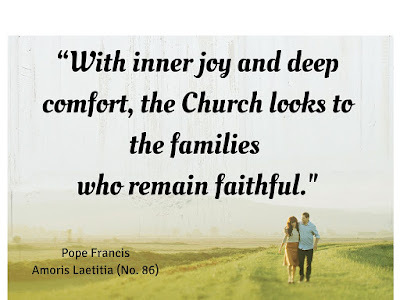 With inner joy and deep comfort, the Church looks to the families who remain faithful to the teachings of the Gospel, encouraging them and thanking them for the testimony they offer. For they bear witness, in a credible way, to the beauty of marriage as indissoluble and perpetually faithful (no. 86). The Lord was witness to the covenant between you and the wife of your youth, to whom you have been faithless, though she is your companion and your wife by covenant… Let none be faithless to the wife of his youth. For I hate divorce, says the Lord. By "supporting one another, growing old together," a husband and wife reflect "God’s own faithfulness," states Francis (no. 319). But fidelity is more than "obedient resignation. Rather, it is a matter of the heart" (id.). Again and again, a husband and wife have to rekindle their desire for love and commitment, he acknowledges. Every morning, on rising, we reaffirm before God our decision to be faithful, come what may in the course of the day. And all of us, before going to sleep, hope to wake up and continue this adventure, trusting in the Lord’s help. In this way, each spouse is for the other a sign and instrument of the closeness of the Lord, who never abandons us (id.). Just as a good wine begins to “breathe” with time, so too the daily experience of fidelity gives married life richness and “body”. Fidelity has to do with patience and expectation. Its joys and sacrifices bear fruit as the years go by and the couple rejoices to see their children’s children. .... Saint John of the Cross tells us that “old lovers are tried and true”. They “are outwardly no longer afire with powerful emotions and impulses, but now taste the sweetness of the wine of love, well-aged and stored deep within their hearts” (no. 231). What will allow married couples to remain faithful, to stay the course, and reach that final stage of contentment? In a word, love. "We cannot encourage a path of fidelity and mutual self-giving without encouraging the growth, strengthening and deepening of conjugal and family love," states the Pope (no. 89). Of course, he is not referring to the ephemeral love of sit-coms and celebrities, but the love that St. Paul eloquently describes in his First Letter to the Corinthians, Chapter 13, a love that is, among other things, forgiving. Forgiveness is not an action that happens once and is over and done. It's a continuing attitude. We don't have to solve everything before we forgive everything. "Even amid unresolved conflicts and confused emotional situations," faithful spouses "daily reaffirm their decision to love, to belong to one another, to share their lives and to continue loving and forgiving," states Francis (no. 163). To forgive one another, we have to acknowledge our part in the conflict. The Pope advises: "In resolving sincerely to forgive the other, each has to ask quietly and humbly if he or she has not somehow created the conditions that led to the other’s mistakes" (no. 236). "Even if it seems clear that the other person is at fault, a crisis will never be overcome simply by expecting him or her to change. We also have to ask what in our own life needs to grow or heal if the conflict is to be resolved," he adds (no. 240). Often our mistakes, or criticism we have received from loved ones, can lead to a loss of self-esteem. We become distant from others, avoiding affection and fearful in our interpersonal relationships. Blaming others becomes falsely reassuring. We need to learn to pray over our past history, to accept ourselves, to learn how to live with our limitations, and even to forgive ourselves, in order to have this same attitude towards others (no. 107). We are more able to forgive others when we have received forgiveness from God. Forgiveness is a grace-filled gift from God, one that we frequently don't deserve. We love God because he first loved us, and we can forgive others because God has first forgiven us. In the Pope's words, "If we accept that God’s love is unconditional, that the Father’s love cannot be bought or sold, then we will become capable of showing boundless love and forgiving others even if they have wronged us. Otherwise, our family life will no longer be a place of understanding, support and encouragement, but rather one of constant tension and mutual criticism" (no. 108). We are more able to forgive when we pray. If our default attitude tends more toward resentment than forgiveness, we can change. We can change through (1) "a sincere self-examination," (2) "recognizing a need for healing," (3) "the determination not to give up but to keep trying." and most of all (4) "insistent prayer for the grace to forgive and be forgiven" (no. 240). Through all these ways, we can learn or relearn the art of faithful and forgiving love. What a great summary of this beautiful and grace-filled letter. Thank you! You're so sweet, Abigail! I really appreciate your visiting the blog to comment. Thanks for your detailed and beautiful descriptions to Amoris Laetitia, Karee! I was shocked a bit at some of the very negative comments from self–styled "apologists" and secularists who try to besmirch Pope Francis inspired document. But I guess these are the very members of the Church who need our prayers...those who "think as men think, not as God thinks!" Satan loves them because they cause division in Christ's Church, consisting of simple, trusting people, the Mystical Body, and not the learned, the "wise", who, from the time of Vatican II and now St. Francis, do not accept the Holy Spirit's guidance of the Church! Thanks to God the Father, His Son and the Holy Spirit! I completely agree that stirring up controversy and divisiveness does not help the Church! 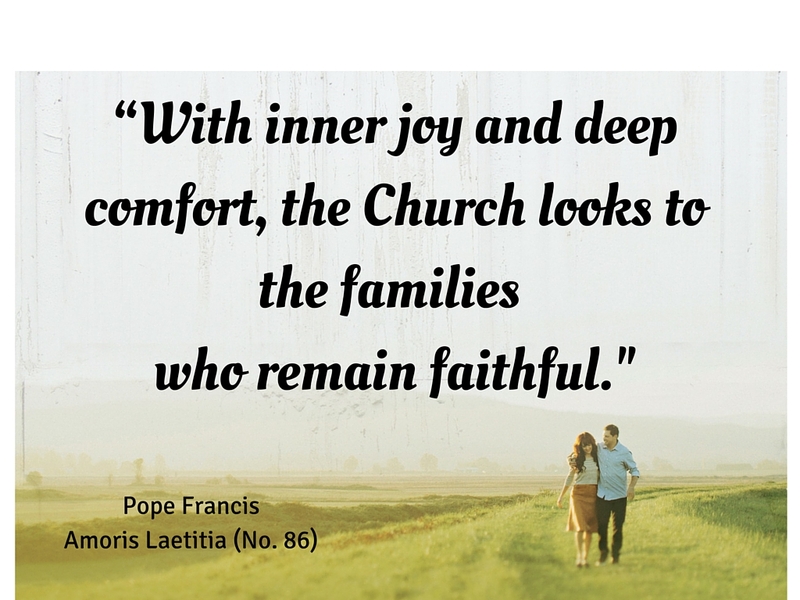 There is so much good in Amoris Laetitia -- that's what I want to focus on. Thank you for being so supportive and kind!